Wood templates will ensure that both pairs of tracks keep constant radii and spacing, even as each pair seperate from each other. ©2011 Ryan C Kunkle, licensed to About.com, Inc.
Track planning is an important part of the model railroading process. It is important to know that everything you want to do is actually going to fit on the layout when you build it. So once you've finally completed those plans, how do you transfer them from paper to the actual platform? The first step can certainly be a little intimidating. After all, you can't just fix this with an eraser. Straight track and switches are fairly easy to translate. Just measure the drawing and plot the points on the layout. Curves present another challenge however. When laying out curves, the easiest method is to find the center point and swing an arc to mark a consistent radius. This works well for traditional "island" platforms where the center of the curve will be in the middle of the platform. You can see this process in the construction of the Rio Grande Project Layout. But what about inside corners, such as are common on shelf or around-the-room designs? Since the center point of the arc will be in the isle, you could try mounting a fixed point on a tripod, or marking all of the track centerlines before cutting out the subroadbed (similar to what can be seen in this step of building a helix.) But if the benchwork is already in place, the easiest method is to use a curve template. You can buy some smaller templates for alligning track, but larger templates for planning are easy to make. You'll get two radii per template, and you can customize them to any size you need. Begin by laying out the radii on a sheet of plywood, hardboard or similar stiff material. For smaller projects, or curves radii you'll only use once or twice, a good stiff cardboard may suffice. Fix a nail at the center point and use a string or yardstick to mark the arcs at all of the radii you'll need. If you have access to one, a 48" drywall T-square is the perfect tool for this. You can make several templates at once. Tip: If you make the radii the same distance apart as your track spacing, you can make parallel curves with one template. Use a jig saw to cut along the lines and create the templates. If possible, attach the saw to a stringline or other device to guarantee an even cut. Be sure to label each template with the radii on each side. It also helps to write "TEMPLATE" in big letters on each side so it doesn't accidentally find its way into the trash can or built into the layout. 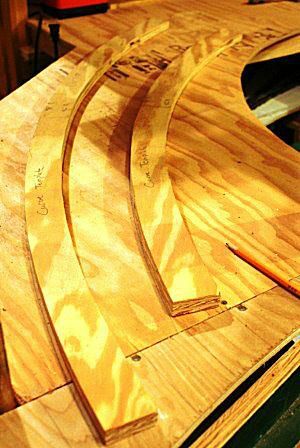 To make curves on the platform or benchwork, simply position the template and trace the edge(s) to mark your track centerline. It can be helpful to have a fixed reference point on at least one end of the curve to position your template correctly. Keep in mind when laying out the curves that this is the perfect time to add in some easements between the curves and straight sections of track. These transitions provide a much smoother ride for the trains. If you need to draw a curve longer than the template, trace the template, slide it forward one-half length and continue. Reapeat as necessary. This will prevent a kink in the curve. With the centerlines drawn, you can proceed to lay your roadbed and track with confidence. Store the templates in a convenient place, you never know when you may need one again.